If you've always wanted to take scuba diving lessons, experience unparalleled adventure and see the world beneath the waves, this is where it starts. Get your scuba diving certification with the Open Water Diver course - the world's most popular and widely recognized scuba course. To enroll, you must be at least 10 years of age or older. You need adequate swimming skills and be in good physical health. Getting certified is accomplished in 3 easy steps! The cost of certification depends on how you choose to study and where you choose to do your open water dives. You can get started learning to dive right now and work at your own pace using the PADI eLearning system. This interactive study option allows you to learn anytime and anywhere you have an internet connection. Access to eLearning will be provided upon registering for class. 2. When do you want to train? Develop your scuba skills with your instructor in our on-site pool and solidify your dive theory in the classroom. For your convenience, classes are offered multiple times per month and are located in the lower level of our retail facility. Our group class ratio is 8:1. 3. Where do you want to do your Open Water dives? The final component of your certification, the Open Water Dives, provides real world experience of what you have learned in your training. There are 4 dives conducted over the course of 2 days. This is your opportunity to show yourself and your instructor your competency as a diver. Located 30 minutes from the shop, Aurora Reservoir could be the perfect option for your schedule, budget and time. An 8-hour road trip is a fun way to complete your open water dives in a 95 degree hot spring! Wherever your destination, we will assist you in finding a dive shop to complete your open water dives! This may be your best option if you are pressed for time. *You pay the same amount of money whether you book your Open Water Dives yourself or through our travel department. Confused about something? Below are some Frequently Asked Questions we hope you will find helpful. For further clarification, please call, click or stop0in to ask a One World Dive & Travel Staff Member! No. Both eLearning integrates both the Knowledge Reviews and Quizzes into the program, requiring each individual to complete their own. What is included in the Enhancement Pack for eLearning option? The Enhancement Pack includes your Student File Folder and Logbook. Why do I need to pay more to get my 10 or 11 year old certified? 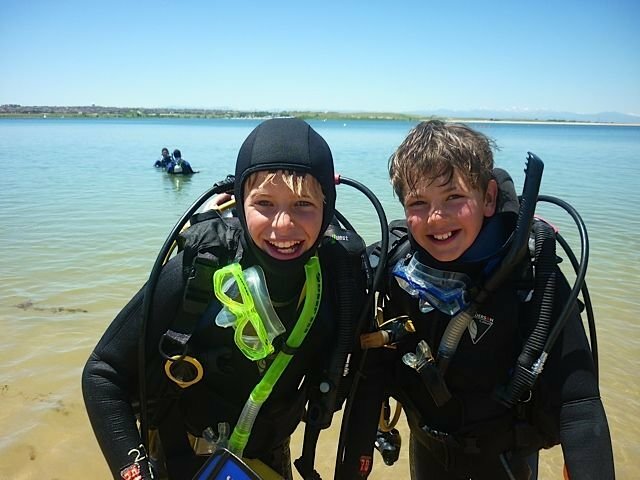 PADI requires 10 & 11 year olds to have a 4:1 ratio instead of the standard 8:1 ratio for ages 12 and up. This is the best way we can ensure the safety of your child both physically and mentally. 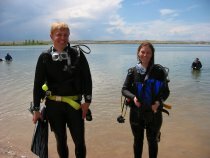 What will it cost me to rent gear for my Open Water Dives at Homestead Crater or Aurora Reservoir for the weekend? There is no additional charge for tanks & weights. 7mm wetsuit is only needed for Aurora. Do I have to be a good swimmer to learn to dive? You will need to float/tread water in the deep end for 10 minutes and be able to swim for 200 yards OR snorkel for 300 yards. If you are concerned about any of these requirements, private swim lessons are available to get you up to par! Your certification is good for life! However, if it's been a while since your last dive you will need to take a Scuba Refresher course. Do I need to be medically cleared by my doctor to Scuba Dive? Only if you answered "YES" to any questions on the required PADI Medical Questionnaire, otherwise no physician release is needed.